Kiyotoshi Shodai - Shinto Taikan. 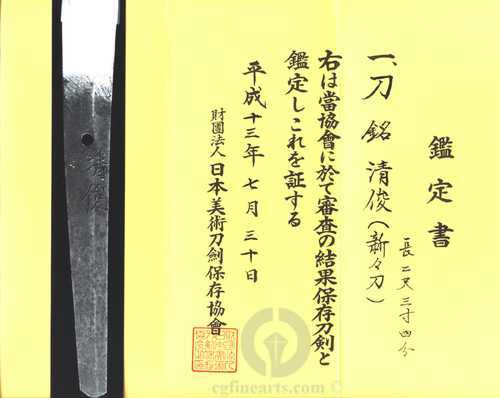 This is a Katana by Tsushima Kiyotoshi, in full Japanese Polish, bearing a solid silver Koshi Yujyo Habaki and mounted in a good Shirasaya with ivory Hatome. It is accompanied by an N.B.T.H.K. Hozon Origami, which states that the blade is Shinshinto. This might be considered 'playing it safe' by the N.B.T.H.K. and I have included an image of the first generation of this maker from the Shinto Taikan, who worked during the Kambun period (1661). One can see great similarities with the signature and Hamon of this generation. There were four generations of Kiyotoshi, who worked up until the beginning of the Shinshinto period.